54 years ago, the Under 21 British Junior Championship in Aberystwyth featured two local players - Vivian Woodward and John Feavyour. At the time, John lived in Saxmundham, whilst Vivian was from Leicestershire (he was then the Leicestershire under 21 and senior champion). 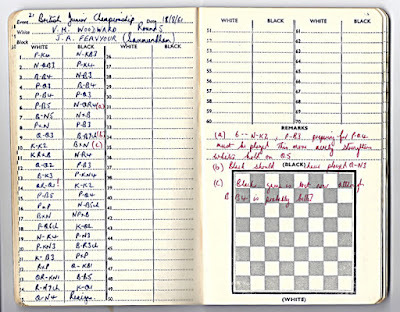 Now a member of Sudbury Chess Club, Vivian has provided the original game score (above) and the game can be played through below (it may take a few seconds to load). The notes to the game are Vivian's, apart from the possible ending after John's resignation. 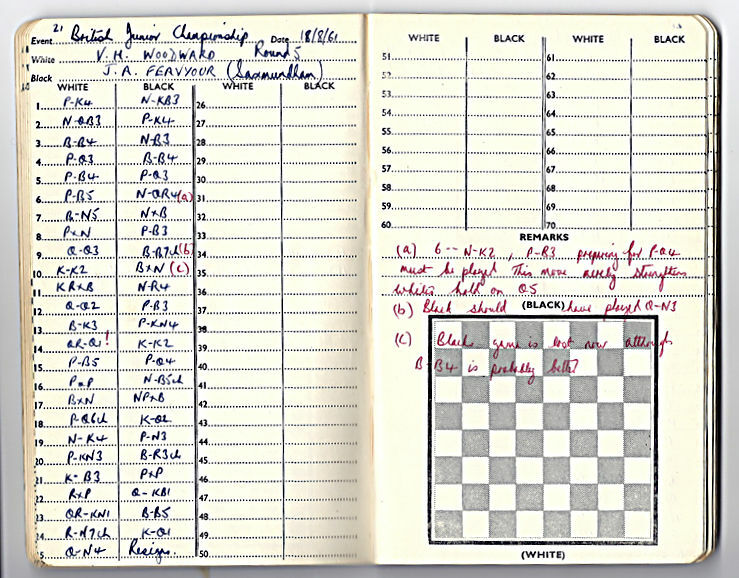 Soon after, Vivian gave up chess for 30 years, but John continued playing. Perhaps they should now play a challenge match, where John may be able to get his revenge! Interesting to read about John and Vivian playing all those years ago - a challenge match sounds a good idea!